It’s been quite a year here at ExoClick, here are some of the highlights of 2016 including innovative platform features, new products, industry awards and more! ExoClick kicked off 2016 by reaching 5 billion daily impressions served daily to its global network of publishing sites. Year on year the company has continually increased the number of daily impressions served. As we enter 2017 we are currently serving 5.5 billion daily impressions. According to research from Syncast, by 2017 74% of all online traffic will be video. In order for our clients to monetise this surge in video traffic, ExoClick launched two new video ad formats: Video banners and Pre-roll in-stream video. Video has a much higher CTR than static images and GIF banners because the content is far more engaging for the consumer, which in turn leads to more conversions. ExoClick used its developer team to give something back to the community by creating the open-source code, fully customisable HTML video player: Fluid Player. Video players are the most important pieces of software within the online entertainment industry and in many cases, publishers are still using Flash and old tech video players. Fluid Player is available on GitHub and works seemlessly with our pre-roll in-stream video ad format. Random : Traffic is spread out evenly between different landing pages. Fixed Shares : Define the exact percentage of traffic each landing page will receive. Automatic Optimization : Based on the multi-armed bandit algorithm, it ptimises traffic distribution based on conversion tracking results. So the landing page that is performing the best will automatically receive most of the traffic, while continuously testing against existing landing pages and any new page that is introduced. 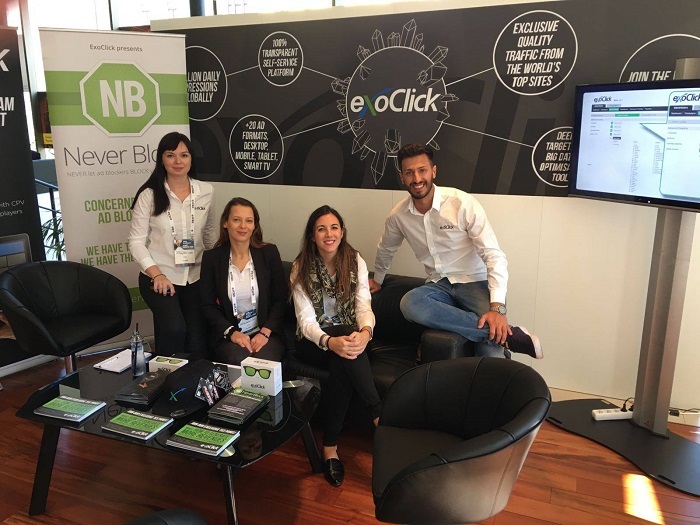 In the year where ad blocking became the ad tech controvesy of the year, ExoClick released NeverBlock. NeverBlock’s advanced technology bypasses ad blockers so publishers can re capture their revenues. The solution is free to all ExoClick clients and is a simple process of placing a line of code on your website. Find out more here and check out our client case study. In 2016 we launched ExoClick University, our in house training program made up of several different modules related to business and smoother workflows. We offered 51 1/2 hours of training sessions that involved workshops, presentations, team activities and knowlege tests. In June we attended the European Business Awards in Milan where we were presented with the Ruban d’Honneur award for ‘The Business of the Year with a Turnover of €26-150m.’ We also made the Inc. 5000 Europe list, ranking at no. 812 as one of the fastest growing private companies in Europe. At the end of 2016 we have now grown our team over 100 people globally! Back in June we held our annual team building event, this year we spent a long weekend in the Catalan beach resort of Pals. And in December we held a special team event for all the companies within our group at our HQ in Barcelona so everyone could get to know each other better and share each others specialist knowledge in different fields of business and technology! And we finished off the year with our 10th birthday! Yes, ExoClick was born way back in December 2006. Founded by CEO Benjamin Fonzé, which he runs with his brother COO Adrien, the company has grown to become the 4th largest ad network in the world, and as we enter our 10th year expect to see us continue to expand our business as we continue to develop and launch even more innovations within the ad tech world.